:: Montreal 360 Photographer - visites virtuelles, virtual tours, panoramic immersive VR photography in Québec. Photographie panoramique immersive, Photographe à Montréal. Panoramas on/sur iPad, High definition, Haute-résolution, photo-bulles, réalité virtuelle, virtual reality. The view of the Adirondacks (US) from the Hurricane Mountain fire tower. The tower has been closed to visitors for some time now so the only way to enjoy the panoramic view from the lookout is here. Not Montreal I know, but this is a only a few hours drive from here and a nice place to go hiking with snowshoes. There are some good trails up to the observatory or if you just can’t overcome lazyness, take the shuttle at the park’s entrance then go all the way down by walking. This Albertosaurus libratus – from the same family as the T-Rex – can be seen in the Dawson gallery of the Redpath museum of the McGill University, one of Canada’s oldest free-standing museums. Fireworks at the quai and a show at the Jacques Cartier square made the party for thousands of people that gathered at Montreal’s Historic Center for the New Year’s Eve. The sound was recorded at the site with a H2 Zoom recorder using a Redhead windscreen. Two panoramas (tulips festival and McGill campus at night) from Montreal photographer Eduardo Hutter were on display on the Ultra Wide Views (UWiVi) at the École Polytechnique de Montréal, during the LGM 2009. The above panoramic photo was taken by Yuval Levy. Thursday Oct. 22, former U.S. president George W. Bush faced a demonstration against his presence in Canada for an event organized by the city’s chamber of commerce at the Queen Elizabeth Hotel. Ironically, this is the same place where 40 years ago, John Lennon and Yoko Ono held their famous one week bed-in and recorded the anti-war anthem “Give peace a chance”. Inside, nearly a thousand people paid $400 each to hear Bush speak while on the outside a riot squad in full gear and several horseback police officers held back a crowd of shoe-tossing protesters who were accusing G.W. Bush of war crimes and torture. Considered by many as one of the best places for kayaking, the Ottawa River have been hosting different international competitions, e.g., the 2007 World Kayak Championship. None of this took place here on Bate Island at Canada’s capital, but down the river on its way to Quebec, near the Pontiac region. Yet, this is a great place for learning and training! Are you ready to put on your bathing suit and take a plunge into a freezing cold water? Well, Montrealers are not afraid of the cold and that’s what these guys did on a -10º C Saturday at the Jean-Drapeau park! The Polar Bear Plunge is a fund-raising activity organized by the Law Enforcement Torch Run officers for the benefit of the Special Olympics Quebec . The Special Olympics movement is active in over 165 countries with more than 2.25 millions special athletes of all ages registered worldwide. Its mission is to enrich the lives of individuals with an intellectual disability through sport. Montreal360.ca is now on Google Earth! 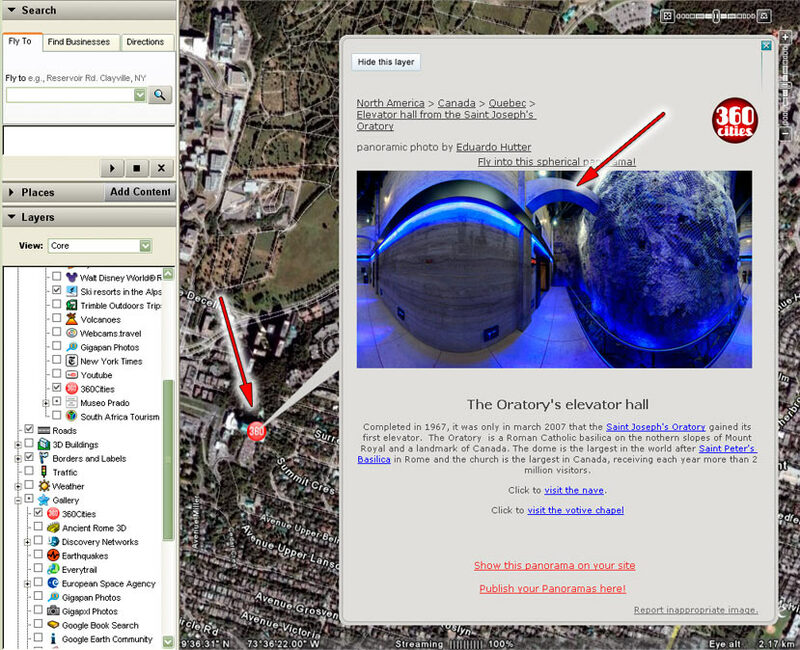 Now you can find the panoramic photography and virtual tours from Montreal360.ca on Google Earth (GE) too! The preview layer for 360Cities is activated by default when you install GE but to see its full content, nearly ten thousand panoramas and growing daily, you have to activate the 360Cities full-view layer located under Gallery (see picture below). To see all 360Cities content on GE you just have to activate the 360Cities layer under Gallery. To ‘fly’ into an interactive panorama, you click on the 360Cities icon to have a flat preview, then click on the preview to open the spherical panoramic photography. When visiting Montreal in 1881, Mark Twain said “This is the first time I was ever in a city where you couldn’t throw a brick without breaking a church window.” This is certainly true still today and one of the finest examples of the city religious heritage is the Cathedral-basilica Mary, Queen of the World, located downtown. Click on the picture to open a 360 panoramic virtual tour. Although it doesn’t have the same glamour as the North American International Auto Show in Detroit, Montreal International Auto Show brought last year more than 200 thousand people to the Palais des Congrès, downtown Montreal. In its 41th edition this year, the trade fair is a major display for the industry in Canada and Canadian dealers are expecting good business, despite the crisis that is making consumers’ wallets less heavier. Completed in 1967, it was only in march 2007 that the Saint Joseph’s Oratory gained its first elevator. The Oratory is a Roman Catholic basilica on the nothern slopes of Mount Royal and a landmark of Canada. The dome is the largest in the world after Saint Peter’s Basilica in Rome. During the summer Montreal is thriving with festivals: Just for Laughs, Nuits d’Afrique, Fringe and Francofolies just to cite a few but Montreal Jazz Festival is probably the most famous of all, know as the biggest jazz festival in the world. In the afternoons, the Swing Tonique Jazz Band and Swing Connexion led the Louisiana Parade across the streets, pictured here in a 360 degrees panorama, paying a tribute to the Dixieland. The entrance for McGill University main campus on Sherbrooke st., not far from The Secret Bench pictured on another 360° panorama.